Indeed, the concept of informal learning has been around for many years preceding the peak of the industrial revolution during the 19th century in the form of guild support for traditional apprenticeships, and is ubiquitous in the knowledge-based economy of the 21st century in the form of cognitive apprenticeship (Collins & Kapur, 2014). Knowledge is integrated in the life of communities. Learning is an act of participation. Knowing depends on engagement in practice. Engagement is inseparable from empowerment. Failure to Learn is often the result of exclusion from participation. Self-directed learning – learner-initiated and -guided learning activity including goal setting, resource identification, strategy selection, and evaluation of outcomes. Incidental learning – an accidental by-product of another learning activity that occurs outside of the learner’s direct stream of consciousness as an unplanned or unintended consequence of doing something else. Tacit learning – the most subtle form of informal learning, which occurs at the subconscious level based on intuition, personal experience, or emotion that is unique to the individual learner. Integrative learning – integration of non-conscious tacit knowledge with conscious learning activities providing creative insight through non-linear implicit processing. In the training industry, informal learning is often discussed in the context of the “70:20:10 Rule” (please see Association for Talent Development (ATD) at www.td.org [http://www.td.org/] and do a search on 70:20:10). Generally speaking, this suggests that: 70% of learning occurs through informal or on-the-job learning; 20% through mentoring and other specialized developmental relationships; and the remaining 10% through formal learning including course work and associated reading. There are two important takeaways from the assertion of the so-called 70:20:10 Rule, as it relates to workplace learning. First, there is a growing body of research providing insight into just how widespread and embedded informal learning is in the lives of adult learners, with estimates of as high as 70-90% of all learning over the course of a lifetime, occurring via informal learning activity (Merriam & Bierema, 2014). Specific to learning about science, Falk and Dierking (2010) placed the estimate even higher, with as much as 95% of all science learning occurring outside of school, given the richness, availability, and increased access to “free-choice” (i.e., informal) digital learning resources. Based on this premise, Falk and Dierking (2010) contended that a policy of increased investment in informal learning resources would provide a cost-effective way to increase public understanding of science. The second takeaway is the recognition that formal and informal learning occurs along a continuum—comprised of both formal and informal learning activities, depending on the type of learning and level of mastery required, as well as the characteristics and prior experience of the learner—as opposed to dichotomous categories of formal vs. informal learning (Sawchuk, 2008). 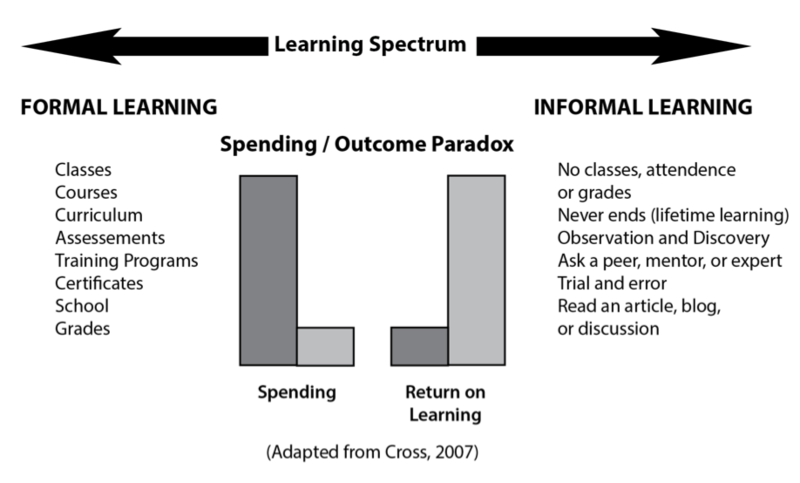 In the following illustration, Cross (2007) presented what he referred to as the spending/outcome paradox of learning. The suggested paradox is that while formal learning represents 80% of an organization’s training budget, it provides a mere 20% return on learning in terms of performance outcomes. Conversely, informal learning on average represents 20% of training resources, yet delivers 80% of the learning occurring within the organization, measured in terms of performance or potential performance. The spending/outcome paradox remains a global challenge as noted by De Grip (2015), “Policies tend to emphasize education and formal training, and most firms do not have strategies to optimize the gains from informal learning at work.” (p. 1). This leads us to a definition of informal learning as “the unofficial, unscheduled, impromptu way people learn to do their jobs . . . Informal learning is like riding a bike; the rider [learner] chooses the destination, the speed, and the route.” (Cross, 2007, p. 236). In other words, learners decide what they need to learn and then establish their own learning objectives and agenda. In addition, learners determine when they should learn, and select the format and modality that best meets their needs. Perhaps most importantly, the learner is responsible for organizing and managing his or her own learning-related activities. To fully engage learners and to ensure that a transfer of knowledge occurs, informal learning should be authentic and ideally occur in the workplace or other performance setting, be situated in a meaningful context that builds on prior knowledge, and employ strategies and activities to promote transfer of knowledge (Boileau, 2011). In informal learning, learners are “pulled” into the learning experience based on a problem, or identified knowledge and skills gap, which is determined by the learner who then engages in learning activities intended to close the knowledge gap or otherwise mitigate the performance challenge or problem. In contrast, in formal learning, learning objectives and curricula are determined by someone else. Formal learning or “book learning” is what most people in western culture think of when they envision learning in terms of schools, classrooms, and instructors who decide what, when, and how learning is to take place. “Formal learning is like riding a bus: the driver [instructor] decides where the bus is going; the passengers [learners] are along for the ride” (Cross, 2007, p. 236). In formal learning, learning is “pushed” to the learners according to a set of needs or predetermined curricula that are established by someone other than the learner. In this section, I have discussed informal and formal learning as co-existing in a spectrum or continuum of learning activities linked to experience and performance context over the course of a lifetime, as opposed to dichotomous branches of learning that are fixed in time and space. This is an important precept to keep in mind because increasingly, blended learning experiences may include elements or activities associated with formal learning settings such as lectures or media-based presentations, along with informal learning activities such as discussions with peers, Web-based searches for examples, and practice experimenting with new techniques and tools (Lohman, 2006). This section examines some of the trends and issues associated with informal learning from an individual and organizational perspective. In previous generations, learning was (and still is) often viewed as separate from performance, and linked to identifiable stages of human social-cultural development. In terms of formal learning, this includes primary and secondary education (K-12) to prepare an individual for participation in society, whereas post-secondary education has historically provided additional preparation for a career with increased earnings potential. Informal learning, as discussed in the preceding sections, addresses learning in terms of a series of non-linear episodic events, experiences, and activities occurring in the real world over the course of a lifetime, having financial and social consequences for individuals and organizations. Science learning. There is increased recognition of the need to support lifelong science learning in order to meet the growing demand for science and engineering jobs in a modern global economy. It can be argued that science literacy, acquired through informal learning, is essential to economic growth (as discussed in the next topic), and to promoting the shared cultural values of a democratic society. According to Falk et al. (2007), “the majority of the public constructs much of its understanding of science over the course of their lives, gathering information from many places and contexts, and for a diversity of reasons.” (p. 455). Evidence of this trend can be seen in new standards for compulsory testing and curriculum changes, placing greater emphasis on STEM (science, technology, engineering, and mathematics) subjects in publicly funded K-12 education. Yet, the average adult spends a small fraction of their life (1-3 percent) in formal education related to science learning (Falk, Storksdieck, & Dierking, 2007). Indeed, the research literature suggests that most science learning, as with other domains of learning, occurs informally and is driven by self-identified needs and interests of learners. This suggests that informal learning activities within the workplace, personal investigation using internet-based tools and resources, and active leisure pursuits such as visits to museums, zoos and aquariums, and national parks account for the majority of science learning in America (Falk & Dierking, 2010). Other forms of informal science learning include hobbies such as model rockets and drones, organic and sustainable farming, beekeeping, mineralogy, and amateur astronomy. Life events may also trigger a personal need for informal science learning via the web such as when individuals are diagnosed with an illness like cancer or heart disease, or in the wake of environmental disasters such as oil spills, the discovery of radon gas in rock, or tracking the path of a hurricane. The Internet now represents the major source of science information for adults and children, with the tipping point occurring in 2006, when the Internet surpassed broadcast media as a source for public science information, according to the Pew Internet and American Life Project (Falk & Dierking, 2010). In a similar fashion, more people now turn to the Internet for medical diagnostic information using services like WebMD.com, before scheduling an appointment with their physician. Return on learning within organizations. The implications of informal learning for organizations are significant in terms of expectations for individual and organizational performance. Specifically, return on learning (i.e., return on spending for learning) has increasingly become linked to an organization’s bottom-line. It is no longer enough to simply have well-trained employees with advanced degrees and certifications gained through formal education and training, unless employees are also able to demonstrate advanced skills leading to valued on-the-job performance outcomes. The result is a shift in many organizations from training to talent management, taking advantage of eLearning innovations, including online and just-in-time learning technologies, to support personalized and sustainable professional development. This trend is supported by a growing body of evidence from the Organisation for Economic Co-operation and Development (OECD.org), suggesting that informal learning in the workplace is a principal driver of human capital development for employees of all age groups, with the greatest impact shown in the performance of younger workers as advanced learning and skills are attained through work experience (De Grip, 2015). Microtraining. As previously suggested, organizations have continued to over-invest in and, in some instances, overestimate the value of formal training programs relative to the spending/outcome paradox and return on learning, while potentially missing out on opportunities to fully leverage informal learning processes (Cross, 2007). Microtraining provides a possible mechanism to help address this perceived imbalance, by focusing attention along the entire learning spectrum, as opposed to a strict separation of learning activities between formal and informal learning domains. Microtraining is an instructional technology intervention that integrates formal with informal learning activities, using short learning segments designed for rapid development and dissemination of knowledge that can be completed in 15-minute time blocks, in close proximity to the work setting (De Vries & Brall, 2008). According to De Vries and Brall (2008), microtraining learning segments are used to provide a structure combining semi-formal learning activities with informal and ad hoc learning processes. This structure begins with activation of prior knowledge, followed by demonstration/practice, feedback session, and transfer strategy. In addition, all microtraining segments should promote critical thinking and reflection on work, to facilitate deeper learning. The microtraining approach is generally well suited for performance remediation, knowledge refreshing, and development of mastery in topics already familiar to learners. Conversely, microtraining may be less ideally suited for novice learners unless it is combined with other strategies for scaffolding learning in order to build prerequisite knowledge and skills. The primary benefit of microtraining is in its ability to provide just-in-time, non-formal training within the work setting, causing minimal disruption to the daily work schedule as employees considered vital to the enterprise are not required to travel to another location in order for learning to occur (De Vries & Brall, 2008). Microtraining draws from the theoretical foundations of constructivism and connectivism, recognizing the social aspects of informal learning, and the role of learning communities within communities of practice, for facilitation of lifelong learning. Learners play a central role in contributing to the collective knowledge of the community while building their personal sense of identity, at the same time providing a positive incentive for sustained participation in the learning community (Lave & Wenger, 1991). Organizations committed to microtraining understandably play an instrumental role in enabling communities of practice. In this capacity, the organization commits the resources to support development of microtraining learning units. Implementation of microtraining via learning communities also requires different roles for learners and trainers than those traditionally held within the organization. Specifically, learners assume primary responsibility for personal and team learning processes; whereas the trainer’s role shifts from presenter to learning coach/facilitator in support of informal learning activities. Microlearning. A closely related trend is microlearning, which is an emergent informal learning strategy intended to quickly close gaps in knowledge and skills, in the context of completing a task. Microlearning is most often mediated by Web 2.0 technology on mobile devices, involving short bursts of inter-connected and loosely coupled learning activities, having a narrow topical focus (Buchem & Hamelmann, 2010). In other words, microlearning tends to build depth, as opposed to breadth of knowledge, particularly when the learning event is situated in the performance of a skill needed to complete a task. Diversity of sources – Sources for microlearning activities include a range of options and services in diverse media formats including blogs, wikis, Kahn Academy video courses and lessons, YouTube tutorials, infographics, TEDTalks, and an increasing number of Open Educational Resources (OER). Learning types – Microlearning may be applied to a wide range of learning types, goals, preferences, and theoretical frameworks (e.g., cognitivist, constructivist, connectivist), producing mashups of informal and formal learning activities. Cost – Production costs of learning objects used in microlearning tend to be lower than traditional course development costs given the brevity and narrow topical focus of learning episodes. As the range of topics and number of Open Educational Resources continues to rise, content costs should be expected to continue to decline. Access – Increased Web 2.0 and mobile access for content production and consumption has made microlearning ubiquitous for learners in many parts of the world, via learner-defined Personal Learning Environments (PLE) where all you need is a smartphone to participate. Connected learning – Microlearning facilitated by social media technologies (e.g., Facebook, Twitter, LinkedIn) provides new ways for collaborative and cooperative learning to occur via Personal Learning Networks (PLN) and within Communities of Practice (CoP). Performance support tools. Another informal learning trend is Performance Support Tools (PST). Rossett and Schafer (2007) defined performance support as “A helper in life and work, performance support is a repository for information, processes, and perspectives that inform and guide planning and action.” (p. 2). Performance support tools are in many ways analogous to the concepts and affordances discussed with microlearning. Indeed, many of the tools and activities used to support learning and performance discussed in the preceding paragraphs have existed since the early days of personal computing and the Internet, in the form of Electronic Performance Support Systems (EPSS). Gery (1991) first coined the term EPSS as the intentional and purposeful integration of technology, information and cognitive tools to provide on-demand access to expert advice, guidance, assistance, and training to facilitate high performance levels on the job, while requiring minimal support from others. Performance Support Tools serve as job-aids to help facilitate completion of a task or achievement of a goal, while at the same time have a mediating effect on informal learning activities that support desired performance outcomes (Boileau, 2011). This results in the formation of reproducible patterns for learning and performance, comprised of linked actions and operations that are aligned with performance outcomes, adding to the learner’s personal knowledge and skills repertoire. Over time, these regular and recurring patterns in learning and performance activity systems can evolve into practices shared by other members of the community of practice (Greeno & Engeström, 2014). These practices are shaped by and, in turn, shape the way PSTs are used to support learning and to affect the transfer of knowledge and skills to on-the-job performance. Information and communications technology (e.g., social media) has been shown to have a mediating effect on practice, using digital representation of signs and symbols for linguistic communication, along with knowledge objects that are produced and exist within the community (Boileau, 2011). As previously stated, Rossett and Schafer (2007) viewed this effect on practice in terms of support for performance, specifically by building a repository of externally curated information, processes, resources and perspectives that inform and guide performance planning and execution, using performance support tools. This approach is less concerned with new knowledge acquisition and more so in direct application and transfer of knowledge, mediated by PSTs. Rossett and Schafer (2007) further categorized PSTs as sidekicks and planners. A sidekick functions as a job aid in the context of specific types of activity performed in realtime, concurrent with the task at hand. An example of a sidekick is a GPS navigation system (e.g., Google® maps application on a mobile device) providing turn-by-turn navigational instructions in the situated context of operating a vehicle. A planner, on the other hand, is typically used in advance of the activity to access prior, externally created, knowledge shared by the community of practice, for use in a specific learning and performance context. An example of this would be accessing Google® Maps via the Web to determine (i.e., plan) the most efficient route of travel between two pre-determined points, in advance of starting the trip. A distinction can be made between performance support tools and other types of tools such as a file cabinet or office chair, used to support informal learning and performance. The difference with non-PST tools is that there is no innate support for the informal learning or performance activity; there is only potential support for manipulating the environment to make it more conducive to achieving the goal for the activity. In a similar manner, “Instruction is not performance support. It is planned experience that enables an individual to acquire skills and knowledge to advance the capability to perform.” (Rossett & Schafer, 2007, p. 5). In other words, there is a separation between the learning event and the performance context. Performance support for informal learning may be further characterized by looking at four factors: convergence, simplicity, relevance to performance, and personalization (Rossett & Schafer, 2007). Convergence is rooted in proximity, meaning that the information and guidance to support learning is situated where the learner/performer and task or challenge exists. Simplicity means having a focus on the content in the here and now, to accomplish a task or to quickly close a gap in skills and knowledge. Relevance increases support for the performer, ensuring the right tools for the job to accomplish his or her goals in a specific context, resulting in increased learner motivation. Personalization allows the learner to dynamically adjust the level of information and support needed, according to the needs of the situation and the prior experience of the learner. Personalization also facilitates user-generated content adding new insight and lessons learned, thus increasing the utility of the tool and contributing new artifacts to the collective body of knowledge available to the community of practice, via a more integrative user experience. Digital open badging. As opportunities for informal learning continue to increase for personal and professional development across different industries and disciplines, a question on the minds of many learners is how informal learning achievements may be recognized (Law, 2015). Digital open badges provide validated recognition of participation and achievement from informal learning activities, and evidence of learning milestones such as completion of a microtraining learning segment. The use of digital badges can also be seen with formal learning in educational institutions, as a motivational tool and in the form of micro-credentials to demonstrate incremental achievement in a variety of education settings. The amount of OER content available to support informal learning has increased exponentially in recent years in support of microlearning. Concurrent with the increase in OER is the emergence of different business models to support the issuance of digital open badges. For example, learners can access OER content for free, through a variety of MOOC (Massive Open Online Course) service providers such as EdX and Coursera. These services provide access to hundreds of courses for free. If you would like to receive a micro-credential (i.e., certificate) as evidence of successful completion, however, you are required to pay a nominal fee. This changes our definition of informal learning provided by Cross (2007) when learners begin to pay-for certification by MOOC providers, because informal learning is no longer anonymous when attendance is tracked and grades are issued (Law, 2015). This trend is expected to continue according to Law (2015) as “learners in an informal environment are willing to pay for certification and recognition of unsupported informal learning.” (p. 232). Summary. In this section, we have examined some of the trends, issues, and tools used to facilitate informal learning, noting the emergence of four themes. First is that informal learning is situated in performance, knowledge development, or in completion of a task, and is driven by intrinsic as well as extrinsic motivation. Second, as organizations refocus their attention from training to talent management, they look to innovative methods and learner-centered processes to enable communities of practice. Third is that technology and more specifically, performance support tools are at the forefront of informal learning, serving as job-aids intended to mediate informal learning activities that support job performance. Finally, the use of digital open badges is expected to increase, to eventually provide validated evidence of informal learning outcomes. I conclude this chapter by considering the role of culture in learning. The paradigm used to understand informal learning is influenced by a set of assumptions around learning that are firmly rooted in culture. For example, the concept of informal learning in the West is inevitably linked to Western philosophies such as liberalism, progressivism, humanism, behaviorism, and radicalism (Merriam & Bierema, 2014). This provides a unique cultural lens through which learning events and activities are perceived that is further shaped by personal experience and access to information surrounding global events, which may vastly differ from the view of education and learning held by people living in different cultural settings from our own. Ironically, while informal or experiential learning is clearly evident in all cultures, “it is less valued in the West where formal book knowledge predominates.” (Merriam & Bierema, 2014, p. 243). It is also interesting to note that this is consistent with the “spending/outcome paradox” noted by Cross (2007) that was discussed earlier in this chapter. Merriam and Bierema (2014) identified three themes in knowing and learning that are more prevalent among non-Western cultures, characterized as communal, lifelong and informal, and holistic. To say that learning is communalimplies that it is situated within the community as a means for collaborative knowledge development that benefits from, and exists within, the entire community through strong interdependency and relationships among the members. This stands in contrast with Western culture in which the learner is more typically viewed from an individualistic and independent perspective. The second theme is that informal learning is a lifelong pursuit that is also situated within the communal ethic (Merriam & Kim, 2011). The concept of informal lifelong learning is evident in the Buddhist principles of mindfulness; can be seen in the African cultural expectation that members of the community share their knowledge with each other for the benefit of the community at large; and may be found in the words of the Prophet Muhammad: to “Seek knowledge from the cradle to the grave.” Finally, the culturally-based theme of informal learning as holistic represents a clear shift from a Western emphasis on cognitive knowing, to alternative types of learning that include: somatic, spiritual, emotional, moral, experiential and social learning (Merriam & Kim, 2011). Approaching informal learning from a more culturally holistic perspective creates new opportunities to increase cultural sensitivity among increasingly diverse learner and worker populations, by recognizing that learning is embedded in performance activities and in the experiences of everyday life. Take five minutes and think about your own experiences with informal learning. How has technology influenced your informal learning? Give your best assumption of how much informal learning occurs outside of a technological medium vs. how much informal learning occurs through a technological medium. Think of a work or school situation where learning was formal. Knowing that there is a better chance of meeting learning outcomes with informal learning, what adjustments would you make to create a more informal learning experience? Boileau, T. (2011). The effect of interactive technology on informal learning and performance in a social setting. Wayne State University. Buchem, I., & Hamelmann, H. (2010). Microlearning: a strategy for ongoing professional development. eLearning Papers, 21(7). Collins, A., & Kapur, M. (2014). Cognitive apprenticeship. In Sawyer, R.K. (Ed. ), The Learning Sciences (2nd ed., pp. 109-126). New York: Cambridge University Press. Coombs, P.H., with Prosser, R.C., & Ahmed, M. (1973). New paths to learning for children and youth. New York: International Council for Educational Development. Cross, J. (2007). Informal learning: Rediscovering the natural pathways that inspire Innovation and Performance. San Francisco, CA: Pfeiffer. Falk, J. H., Storksdieck, M., & Dierking, L. D. (2007). Investigating public science interest and understanding: Evidence for the importance of free-choice learning. Public Understanding of Science, 16(4), 455-469. Driscoll, M.P., (2005). Psychology of learning for instruction (3rd ed.). Boston, MA: Allyn & Bacon. Gery, G.J., (1991). Electronic performance support systems. Cambridge: Ziff Institute. Greeno, J.G., & Engeström, Y. (2014). Learning in activity. In Sawyer, R.K. (Ed. ), The learning sciences (2nd ed., pp. 109-126). New York, NY: Cambridge University Press. Law, P. (2015). Digital badging at The Open University: recognition for informal learning. Open Learning: The Journal of Open, Distance and e-Learning, 30(3), 221-234. Lohman, M.C. (2006). Factors influencing teachers’ engagement in informal learning activities. Journal of Workplace Learning, 18(3), 141-156. Mayer, R.E. (2005). Cognitive theory of multimedia learning. In R.E. Mayer (Ed. ), The cambridge handbook of multimedia learning (pp. 31-48). New York: Cambridge University Press. Merriam, S.B., & Bierema, L.L. (2006). Adult learning: linking theory and practice. San Francisco, CA: Jossey-Bass. Merriam, S.B., & Kim, Y.S. (2011). Non-western perspectives on learning and knowing. In Merriam, S.B., & Grace, A.P. (Eds. ), The Jossey-Bass reader on contemporary issues in adult education, pp. 378-389. San Francisco, CA: Jossey-Bass. Rossett, A., & Schafer, L. (2007). Job aids and performance support: Moving from knowledge in the classroom to knowledge everywhere. San Francisco, CA: Pfeiffer. Sawchuk, P.H., (2008). Theories and methods for research on informal learning and work: Towards cross-fertilization. Studies in Continuing Education, 30(1), 1-16. Tim Boileau teaches graduate level courses in Instructional Design and Technology (IDT) and Human Performance Technology (HPT) with a combined 20 years of teaching experience. He has also worked as a global performance consultant for 30 years, focusing on informal learning and performance solutions. He earned his PhD in Instructional Technology from Wayne State University and also holds degrees in electrical engineering and computer science. 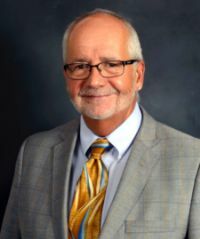 Tim is the current President of the Division of Organizational Training and Performance (OTP) for AECT, and has been a member since 2003.